Color(s): Uniform color or with a black mask or muzzle; reds, red brindle, piebald; black undesirable. 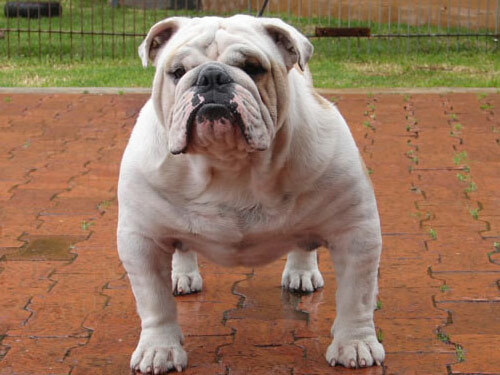 One of the gentlest breeds, the English Bulldog has grown in popularity. Originally bred for baiting bull, this breed can be intimidating but is very affectionate and surprisingly gentle. English Bulldogs do fairly well with children. This breed is sturdy and can withstand child play. This short nosed and stocky breed loves attention. A very reliable, loving, and gentle breed, this dog makes an excellent companion for children and adults. More of a human companion, the English Bulldog also does well with other dogs and cats. This breed is always looking for guidance from his owner. The English Bulldog can display dominating behavior and requires a firm handler to show him his place. Great for a loving family, the English Bulldog gives a lot of love and attention, and expects it in return. This breed has been used as a guard dog, and does exceptionally well given the correct training. A rubber brush will be sure to remove any loose or dead hair. Combing will also eliminate much of the hair. The English Bulldog is an average shedder and should be bathed only when necessary. Mouth should be cleaned regularly and underneath the folds of skin with a damp washcloth. The coat of the English Bulldog is very short. It should always consist of smooth, straight, and flat hair that lies close to the body of the dog, and be of fine texture. This breed requires a firm hand and consistent training. Relatively lazy, this breed doesn't need much activity to make a great companion. Does very well as a guard or watchdog. A dominant owner is a must if this breed is to be well mannered. The English Bulldog doesn't require much exercise but would do well with a short walk occasionally. This breed tires out easily and considering the flat muzzle, should always have available water.